Jio Money Offer on Jio Recharges. Here is good news for Jio lovers, now get 50 Rs discount when you pay using Jio Money wallet. Currently lots of companies are providing offers on Jio Recharge. MobiKwik is giving 20Rs cashback to old customers. Paytm is Giving only 10Rs discount on Rs 99 Recharge. And Now, our favorite wallet Jio Money is giving us 50Rs discount. This is best offer so far you are getting from any company. So, if you are using Jio money for recharge of Rs99 then it will cost you only 49 Rs. So, what are you waiting for? Just enroll for Jio Prime and get 50Rs cashback. This offer is valid for all customers. You Just need to follow some simple steps for successful payment through Jio Money App. Open Jio Money App or Download if you are using it for first time. Now Open MyJio app, visit payment tab, and do a recharge of Rs 99. Now select payment method as Jio Money. Now complete Your Transaction using Jio Money App. Done, now just wait for two working days to receive your 50Rs cashback. Note: You can use this 50Rs cashback on 303 and above recharges. So, still thinking about offer? hurry up guys, do not waste more time. 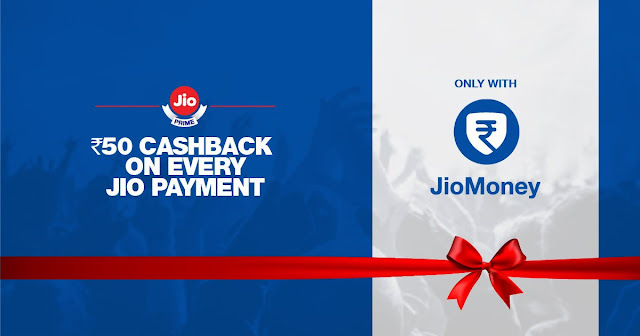 Just pay your Jio Prime subscription fee and get 50Rs cashback with Jio Money Wallet. It is like getting offer on offers. There are some terms and conditions which I want to discuss here. Jio terms and conditions are very customer friendly and they are same for everyone. Like other operators Jio do not have any hidden terms and conditions. This is a limited period offer, which starts from 15th march 2017. In order to get cashback, you have to pay Jio Prime subscription fee as soon as possible as this is a limited period offer. To become eligible for 50 Rs cashback, you have to do Jio recharges of Rs 99 or above using your Jio money Wallet within offer period. After successful transaction of Rs 99 or above, customers will get a 50Rs discount Voucher in Jio Money App. This 50Rs discount is only applicable on recharge of Rs 303 or higher. You can redeem your discount code from 25 March to 30th June 2017. You can use this offer only 5 times during offer period. Jio Money wallet is best if you want to save your hard earned money. No other company can ever think about giving this type of offer while Jio is giving us. The terms and conditions are very simple and clear and there is no hidden condition which is a feature of Airtel. You can use this offer 5 times per user, so it is going to save your 250Rs per user Id. You can make more user Ids to get more discount vouchers. Jio money wallet is highly secure and also it is the fastest way of doing online transactions. Wow. I'm fairly new to your blog, but seem to have visited at the right time. from here and highly recommended it.